Once you have configured dhcp and network files, restart the networking on fonera or reboot it. Issue these commands in backtrack. Where wlan0 is the interface that is connected to internet. If you are using your phone’s internet connection tethered to BT, then replace the above interface wlan0 with ppp0. 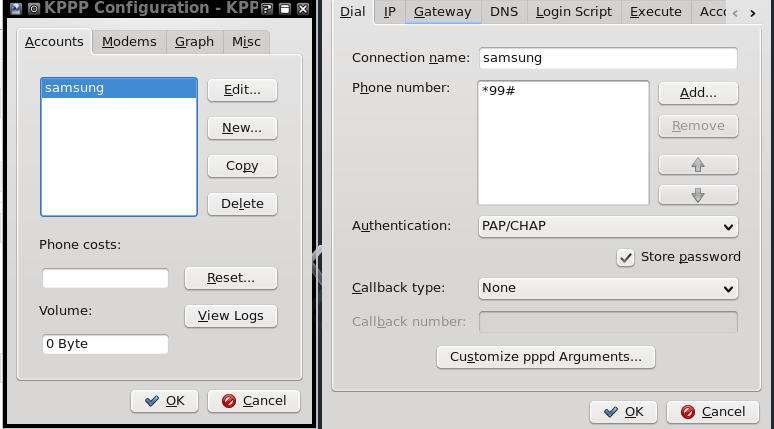 Gateway in that case will be the ip address of ppp0 , which can be found by ifconfig. Change accordingly. Fon should now have internet and so are the clients connected to it. Now we can start our favorite tools on BT. You can troubleshoot by pinging your way bottom up. While on the go, being able to tether internet from your phone to your computer is a fantastic way to stay online. There are many programs to do that in windows, but it is not quite obvious while using BackTrack 4. Here is how you do it. Now connect the phone in modem mode (not usb mass storage mode). If you are using samsung phones, then this mode is called “samsung pc studio” mode. You need to check your phones user manual for the usb connect mode. 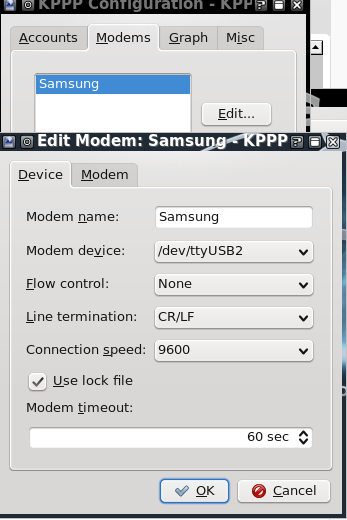 Under modem tab, give it some name and select device accordingly and decrease the baud rate to 9600. It ok under configuration windows, and connect. It should dial and connect to the phone. If you receive error, try reducing the baud rate and try again. You should have an ip, you can check by issuing ifconfig. One of the beautiful features of a Thinkpad : Scrolling using middle button and trackpoint, is missing out of the box on BackTrack 4. Here is how you enable it. now reboot your machine and everything should be working. If you familiar with Linux and Unix environments you might be aware of SSH. In addition to connecting securely to the Unix machines via SSH, you can also tunnel all your web traffic via remote machine. There are many SSH clients available for windows but, I will be demonstrating using PuTTY. First, specify the address of your SSH server in the Session section. Select SSH for the Connection type and enter 22 for the Port (or whatever external internet port you are using to connect to your SSH server). Next, go to Connection > SSH > Tunnels. There are three types of tunnels you can set up. 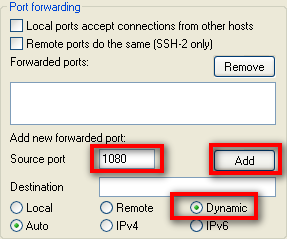 For connecting to a UniX server with public IP, select Dynamic as the port type. et’s first set up a dynamic tunnel for port 1080. The port you use for a dynamic tunnel is actually arbitrary, but since port 1080 is often used for SOCKS proxies that’s what we’ll use. Type 1080 in the Source port field, select Dynamic as the port type, and then click the Add button. Once you have everything configured for the connection, go back to the Session section and save your connection. Then click Open and log into your Linux box with your credentials as you normally would. Now you have to configure your applications to use the tunnels you have set up. Let’s say you want to do your web browsing through the dynamic tunnel we set up. This is actually an extremely useful way to take advantage of SSH. You may be on a network with some sort of firewall or content filtering that you wish to bypass. If you are able to get out on port 22 (or any other port, you’ll just have to set up your SSH server accordingly), then you’ll be able to surf wherever you want without issue through the dynamic tunnel. It is also useful if you are surfing on a network where you may be concerned about others observing your traffic. Perhaps you are connecting from a hotel, a client site, or from work (you didn’t learn that from me) and you do not want others monitoring your traffic. The best choice is to use Firefox, because Firefox allows you to configure the browser to also send DNS requests through the proxy. If you use Internet Explorer, your DNS requests are still made via the local network you connect from and thus can still be monitored. So Firefox would be the preferred browser if you wish to maintain privacy on the network you are connecting from. To set up Firefox to use the dynamic tunnel as a SOCKS proxy, go to the Firefox Options > Advanced > Network and click the Settings… button. In the settings page, click Manual proxy configuration, enter localhost for the SOCKS Host, and 1080 for the Port. We’re not quite done. We still need to configure Firefox to send DNS requests to the SOCKS proxy as well. To do this, enter about:config in the navigation bar in Firefox. You may get a prompt asking you if you know what you’re doing. Assure Firefox that you know what you’re doing and proceed. Enter socks_remote_dns for the Filter and press enter. You should see a single option that says network.proxy.socks_remote_dns. If it says false for the Value, double-click on it so that it says true. You’re now all set. You should be able to surf the web through your new secure dynamic tunnel!